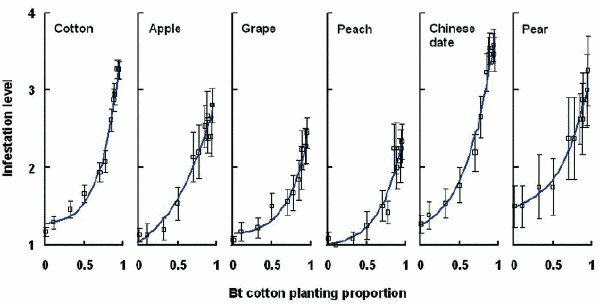 A recent paper by Yanhui Lu and others in Science (DOI: 10.1126/science.1187881) shows how ecological impacts of Bt cotton at the landscape level have lead to a surge in pests. In northern China, the cotton crop is 95% Bt cotton. The paper shows that Mirid bugs have increased both within cotton fields, but also in other crops grown in regions with large amounts of Bt cotton. While the farmers who planted GMO cotton have benefited from it, the increase regional pest load has imposed a burden on other farmers who do not grow Bt cotton – a negative externality. This regional impact on other crops is shown in Figure 4 from their paper. Association between mirid bug infestation levels in either cotton or key fruit crops, and Bt cotton planting proportion. The measure of mirid bug infestation was assigned a score ranging from 1 (no infestation) to 5 (extreme infestation). While this is the first paper, which I’m aware of, to demonstrate such landscape level impacts of GMOs on insect pests, this type of consequence of Bt GMO crops has been predicted for a long time. For example, ten years ago I argued in Conservation Ecology that risk assessment of GMO crops should include not only direct impacts, but indirect ecological impacts, as part of an adaptive risk assessment processes for GMO crops. Below is Figure 1 from that paper. The direct and indirect effects of genetically modified crops interact with the scale at which they are grown to determine the difficulty of predicting, testing, and monitoring their potential impacts. They watched the farms gradually become a source of mirid bug infestations, in parallel with the rise of Bt cotton. The bugs, initially regarded as occasional or minor pests, spread out to surrounding areas, “acquiring pest status” and infesting Chinese date, grape, apple peach and pear crops. The rise of mirids has driven Chinese farmers back to pesticides — they are currently using about two-thirds as much as they did before Bt cotton was introduced. As mirids develop resistance to the pesticides, Wu expects that farmers will soon spray as much as they ever did. Two years ago, a study led by David Just, an economist at Cornell University at Ithaca, New York, concluded that the economic benefits of Bt cotton in China have eroded. The team attributed this to increased pesticide use to deal with secondary pests. The conclusion was controversial, with critics of the study focusing on the relatively small sample size and use of economic modelling. Wu’s findings back up the earlier study, says David Andow, an entomologist at the University of Minnesota in St Paul.